I THINK Joan Namkoong eats everything. Why isn't she as big as a house, then? Probably because she turns all those calories into words and ideas. Joan is a longtime food writer who contributes to these pages at times, but her true mission in life is experiencing food and sharing the good word. 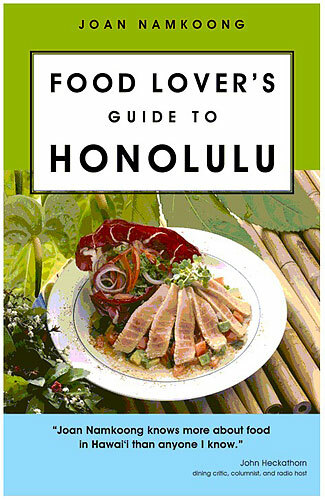 Her latest project is "Food Lover's Guide to Honolulu" (Bess Press, $14.95), a collection of ideas on where to eat, what to eat and how to shop -- covering all those things we call "local." Sunday:noon, Native Books, Ward Warehouse; 2 p.m. Borders Pearlridge; 4 p.m. Barnes and Noble Ala Moana. It's not a cookbook, but a few recipes -- again, very local -- are included. This one seems appropriate to the season. As summer nears, I'm already fielding requests for mac salad, and this is a particularly creamy, hearty one. In large pot, bring 8 quarts water to boil. Add 1 tablespoon salt and macaroni and cook until tender. Drain, rinse with cool water; drain again. While macaroni is still warm, mix with remaining ingredients, using about 3 cups mayonnaise. Cover and refrigerate. Add additional mayonnaise when salad is chilled. Serves 12. Approximate nutritional analysis, per serving: 700 calories, 61 g total fat, 9 g saturated fat, 100 mg cholesterol, 850 mg sodium, 32 g carbohydrate, 1 g fiber, 4 g sugar, 11 g protein.